Talent activation comes down to how the team leaders can improve the work of their team members each and every week. This presents one main question: how does the team leader know the team member and the work he or she is doing well enough to be able to coach this person how to do it better? How does the team leader provide a tweak, a course correction, an adjustment, an idea, a suggestion to help someone do the job better? But if that’s the problem, the tools that we’ve built don’t solve it. In fact, these tools are completely ignorant of the problems we’re actually trying to solve. Feedback is not the solution – team members don’t want feedback; they want attention. Goal alignment is also not the answer – aligning the employee’s goals with the company’s goals is important, but it’s not going to help people perform better week to week. The CEO has no idea about the specific work that’s going on locally. What’s relevant is the real work done by the real team member, and the team leader is in the best position to drive that. Team members want future-focused, individualized attention on how to get better: they want coaching. The team leader’s weekly questions are, what are the team member’s priorities this week and how can I help them? I think there is a complete disconnect in the world of performance management -…and I work in this area usually with Chief Executives. The world of performance goals, KRA’s, measurements, organizational outcomes, strategic alignment – is a discipline in itself- with international conferences and experts. What seems so strange is this world rarely talks to the coaching and positive psychology world academically and vice versa, or within organizations and what Marcus talks about as the ‘real world’ and coaching. Performance Management does not seem to put these two parts together. It is the challenge – to enthuse and optimize a person ( daily, weekly, yearly) – and also create great outcomes for an organization, that individual know and feel they are/were part of. Yes, it’s really about being inspired! Thank you! 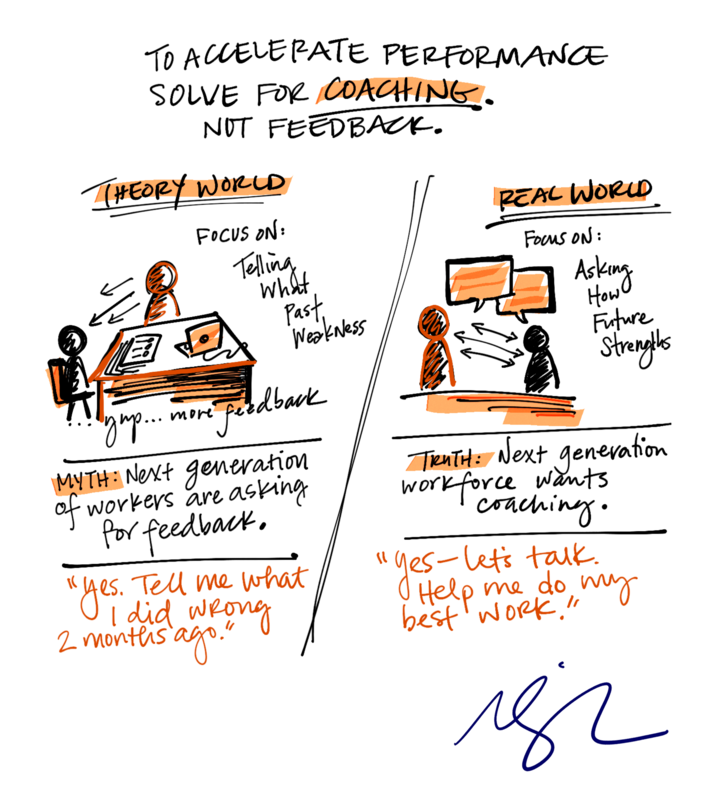 So how are you defining feedback and coaching? Feedback comes from a “something’s broken and you need to fix it” perspective and coaching is a “this is good and how can I help you get even better”. So feedback helps get us to proficient, coaching helps get us to extraordinary performance. I hope that helps, Garth! Your ideas are very refreshing. You are right that employees do need attention and proper coaching could do the wonders. I want to share a bit of research I did recently during my doctorate study on speed to proficiency with over 85 organizations worldwide. What came out is that speed to proficiency or in other words performance is accelerated when managers provide timely coaching / mentoring and support coupled with continuous feedback. I think the attention component you highlighted is what I termed here coaching/mentoring/support. However, it seems that feedback has to be one necessary component embedded in it as well.